I can go tonight at the start time if you are available for game 1. I can only go one tonight though, but Friday I will be available after 5:30 pm MST, let me know what time you can play and we'll get it scheduled out. Make sure both of you post rotations before playing. I can get one in tonight if you're still available. This game was over pretty early as the Redsox put up five runs in the first two innings mostly due to a David Ortiz grand slam HR in the 2nd. Mike Cameron made a gorgeous leaping grab against the center field wall in the 6th inning to keep the Twins off the scoreboard. The only Twin runs would come off of a Delwyn Young 3 run bomb to left field in the 8th inning as the Redsox take this one 8-3. Clay Buchholz was steller through 7 innings until he gave up the HR to Young. Hey Will, I know I said I couldn't play today but I'm actually home for the next couple of hours. Let me know if you can get on. The Twins came out in game 2 swinging the bats while looking to even up the series before heading back to Minnesota. The top of first got started when Denard Span smacked a single into right field, then stole 2nd base, was advanced to 3rd on a single by the O-Dawg, Orlando Hudson, who advanced to 2nd on the throw home. With 1 out and an open base the Redsox's and Jon Lester opted to walk Michael Cuddyer to load the bases for Jim Thome. Who struggled in game 1 with 3 K's. However, he came through big for the Twins and nailed the first pitch he saw back up the middle to plate Span and Hudson. Those two runs would stand alone for the next 8 innings until Jason Kubel scored on a Delwyn Young base hit in the top of the 9th to give the Twins a 3-0 lead. 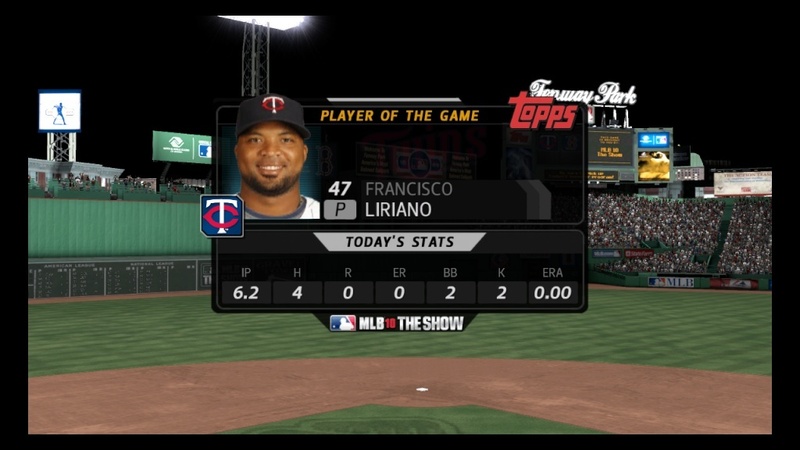 Fransicso Liriano was in true form tonight as he kept the powerful Redsox lineup off balance with a deadly combination of fastball, slider, and change up. Liriano was brilliant through 6 2/3 innings while only giving only 4 hits, walking 2 (both on full counts), and striking out 2. Liriano and the Twins defense only allowed 1 Boston runner to reach scoring position while turning 2 inning ending double plays. Lester in turn threw a gem of game himself striking out 6 Twins, however, Boston couldn't get pass the 2 runs given up quickly in the first inning. Below are Game Highlights as shown on the 10 EST Baseball Tonight. I know we talked earlier in the Show IM about playing in the afternoon. I have a meeting at 2 pm MST but can be home at 3 pm for a game. However, we are attending a wedding that night so I could only get one in. That being said though, I will be free the majority of morning as we will just be doing chores around the house. Let me know. Sorry RSN, apparently I was signed up to help set up for this wedding and was just informed. I won't be able to get on until later tonight, maybe around or after 10 pm MST time. Other than that I can play one Sunday morning before 10 am MST, or after 2 pm I can play too. Post your availability and we'll get this figured out. Sorry man about the short notice. I can get on right now for a fame or two. Let me know if ur available. I am sorry man, I totally missed you this morning, dang it. I will be home this afternoon from 2-4 pm MST to play or after 8 pm tonight. Sorry again. Hope we can get together later today and grab a game or two. cool man, I am logging on now. 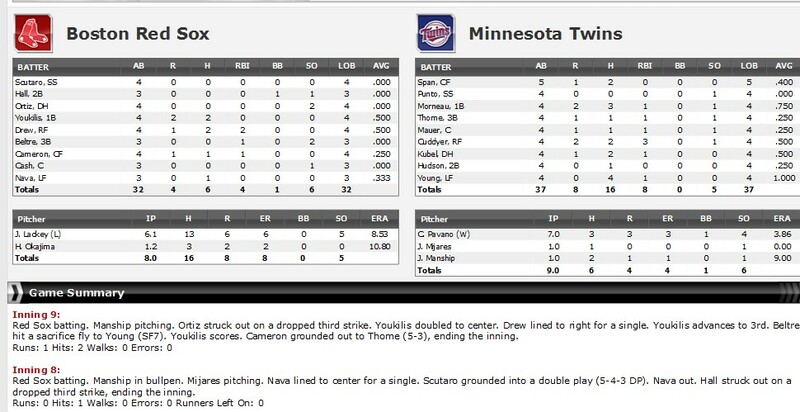 Game 3 started out with 5 runs on 7 hits for the Twins in the bottom of the 1st inning. John Lackey quickly settled down after the rough first to pitch another 5 2/3 before being pulled in the 7th. 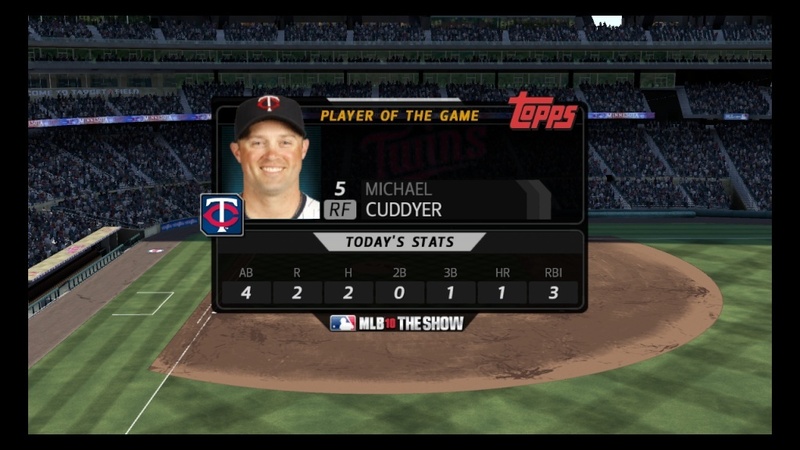 The Twins were led by Player of the Game Michael Cuddyer who was 2-4 with 3 RBI's coming from a triple and a 2 Run HR. Highlights for the Redsox included a solo shot for Cameron and a 2 Run blast by Drew. 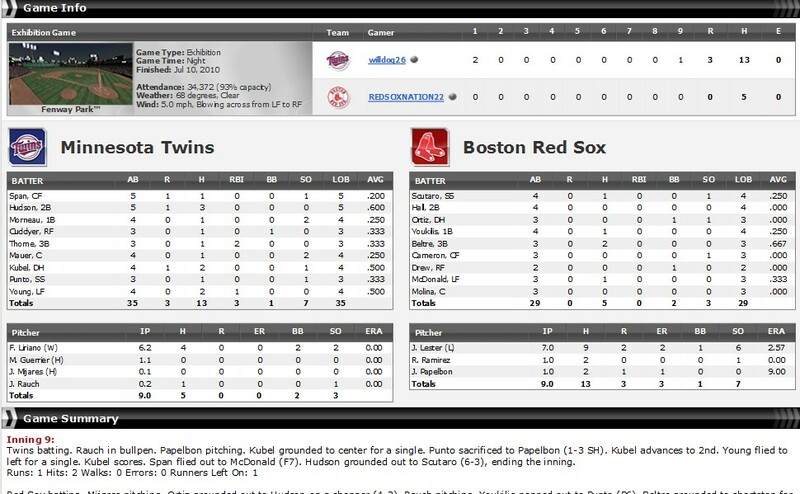 The Redsox would pull within 2 runs of the Twins in the later innings but were unable to sustain a rally as the Twins turned around a put up 3 quick runs in the 7th to establish a strong lead into the late innings. Carl Pavano scattered 3 hits and 3 runs over 7 IP to help the Twins in the win. Minnesota now takes a 2-1 game lead going into game 4 of the Divisional Series in the Berra Division. Toeing the rubber for the Twins in game 4 will be Brian Duensing while the Redsox will throw Dice K Matsuzaka. If the Twins win they will face the Los Angeles Dodgers in the Berra Division Championship series. Rest assured though the Boston Redsox will not make anything easy for these Minnesota Twins in game 4. They play their best ball to force a decisive game 5 in this divisional series. Good luck to both teams. Will, I'm not sure what the final score is. I'm pretty sure I can be on at 5:30 or 6:00. If I can't I'll post on here. Hey Mike, There is a distinct possibility that I wont be able to finish this series off by tonight's deadline. I completely forgot that I need to babysit my nieces tonight while my brother and his wife go to a banquet. I'm trying to recruit my sister to do it for me but I won't know until later, and to be honest I don't think she'll do it. Is there any chance that we can get a one day extension if I'm not able to play? Sorry Will, I totally forgot about this. League Divisional Series extended 24 hours. Thanks Mike. Again I'm not totally sure that I can't get the games in tonight, I'll know when my sis get's back to me. Either way, thanks for the extra time. Hey Will, I can be on at 4:30 EST. and I should be home for the remainder of the evening. Let me know the earliest you can be on. Again sorry for yesterday.